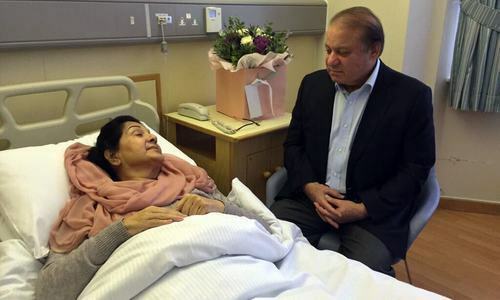 Begum Kulsoom Nawaz, wife of former prime minister Nawaz Sharif, passed away in London on Tuesday after a months-long battle with cancer. PML-N Spokesperson Marriyum Aurangzeb told the Associated Press that arrangements were being made to bring her body back to Pakistan for burial. Party leader Khawaja Imran Nazeer, speaking to the media in Lahore, said Begum Kulsoom may be laid to rest in the family home at Raiwind, but clarified that all decisions will be finalised only after consultation between family members. He said in case the family decides to bury her in Pakistan, the repatriation process may take two or three days. 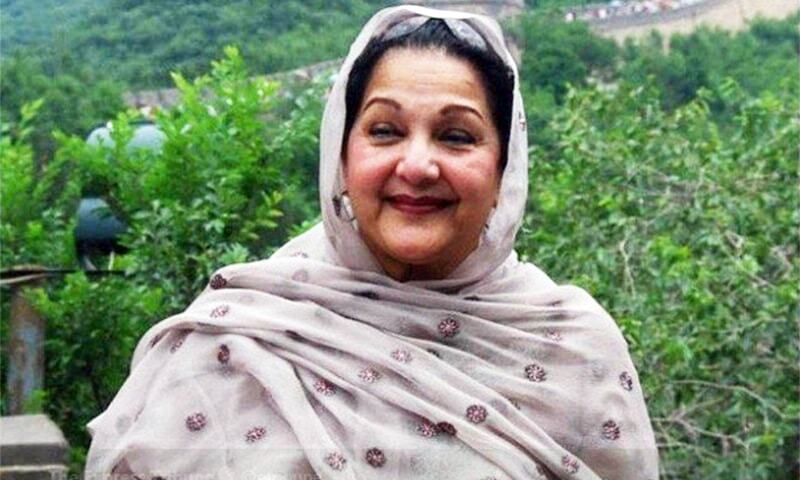 Begum Kulsoom’s health began deteriorating last night as she had developed a lung problem again, Geo had reported. The three-time former first lady was diagnosed with early-stage lymphoma in August last year and had been in London since, where she underwent multiple surgeries and at least five chemotherapy sessions. She had suffered a cardiac arrest and was placed on a ventilator in June this year. Her family reported a slight improvement in her condition on July 12, a day before Nawaz and Maryam were set to return to Pakistan after an accountability court sentenced them to jail in the Avenfield corruption reference. The former PM and his daughter are both currently serving their sentences in Rawalpindi's Adiala Jail. Begum Kulsoom Nawaz was elected to Lahore's NA-120 constituency in a by-poll after her husband was disqualified from the seat by the Supreme Court last year, but left for the United Kingdom before she could begin campaigning for the by-poll. In her absence, Maryam ran her campaign instead. Due to her illness, Begum Kulsoom was unable to return and formally take oath for the seat. Born in 1950 in Lahore to a Kashmiri family, Begum Kulsoom attended Islamia College and graduated from the Forman Christian College in Lahore. She received a Master's degree in Urdu from Punjab University in 1970. 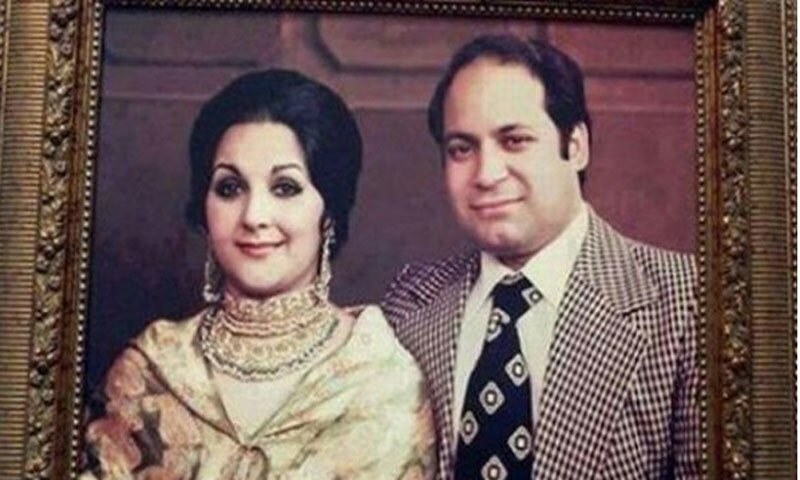 She married Nawaz Sharif in 1971, and served as the president of the PML-N from 1999 to 2002, after her husband's government was dismissed by former president Pervez Musharraf, and nearly all the Sharif family's men were jailed. Both mother and daughter were also placed under house arrest following Nawaz's dismissal by Musharraf. 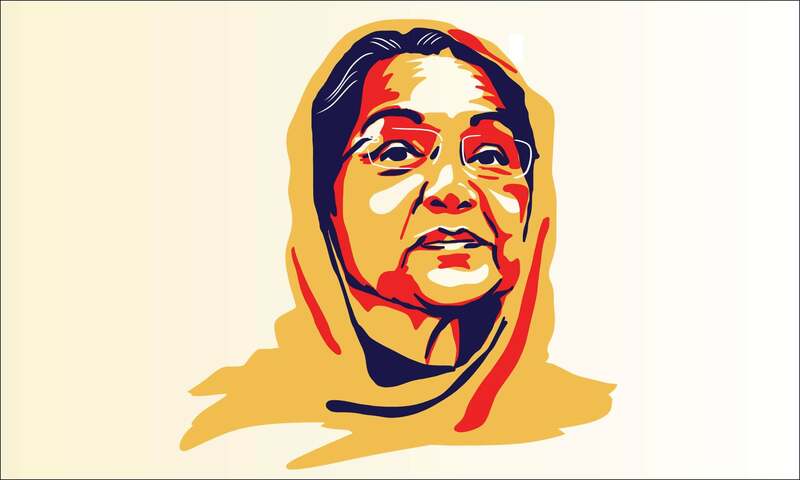 Begum Kulsoom led defiant, lonely protests against the Musharraf regime to get her husband freed from prison. Over the last 30 years, she had stood by her husband and advised him on various government affairs. Party leaders have also said that she occasionally wrote many of Nawaz's speeches. In a 2012 interview with Newsweek, Maryam had said her mother "dauntlessly challenged the usurper when a lot of men backed out... She’s contributed famously to my father’s life and to democracy in Pakistan." Inna lilahi wa inna ilaihi rajaoon. Inna lillahae wa inna elahae rajeoun. Inna Lillahe Wa'inna Alaiyhe Rajeon! Inna Lillaahe Wa Inna Ileihe Rajeouun. Inna Lillah wa inna ilayhi rajiyun. May her soul rest in peace. Inna lillahe wa inna elaihe rajioun. Sad to hear that. May her soul rest in peace. Those who thought her disease was a drama should feel ashamed now. May her soul Rest in peace. What tragic life NS has had, he wasn't allowed to come to Pakistan when his father passed away n now hes in jail when his wife passed away. So sad, may her soul rest in peace, and give the bereaved family the strength to bear this irreparable loss. Ameen. May she RIP. I hope on humanitarian grounds the Government allows all the family members to say proper good by to the decease. Govt. must allow ex PM Shareef and Maryam to attend her funeral. That is the proper thing to do i.e. show some empathy. It is a sad news. The surrounding circumstances like imprisonment of Nawaz Sharif and Maryam Nawaz; her two sons Hasan and Hussain declared as proclaimed offenders make her death more tragic. In case the family decides to bury her in Pakistan the Prime Minister Imran Khan and the Courts should show compassion and magnanimity to allow her imprisoned husband and daughter to attend her funeral. Feeling sad, because in her last days she wasn't accompanied by her husband! RIP! @Z i hope he gets to perform at least his spouse's last rituals. She was graceful and courageous lady who stand with her husband in all odds.She was respected among all nation besides the political differences. PMIK should visit her for the final time. Inna ilahi wa inna ilaihi rajaon. May Al Mighty bless her. A brave and kind soul with whom even political opponents of her husband could not find fault. Inna Lillah e wa Inna elahe rajeoon. @Farooq Jawed . I am hoping that her burial will be in Pakistan and therefore family members will be able to attend funeral. Let us pray for her. She was a good lady i believe. إِنَّا لِلّهِ وَإِنَّـا إِلَيْهِ رَاجِعون - RIP! Sad News. May her soul rest in peace. Rest in peace. A sad moment for the entire nation. Rest in peace First Lady. May you r soul be blessed. Gov should allow NZ n Mariym to attend funeral. RIP ,family must b allowed to participate in her funeral. May her soul rest in eternal peace ameen. I have read so many heartless comments even accusing Nawaz Sharif of making excuse of his wife's illness to prolong his stay in London. @Tahsin Shah will Hassan and Hussain return to Pakistan if begum Kulsoon Nawaz is buried in Pakistan. @Munsif Not the time to get one over. We should all mourn the loss of a noble lady. May her soul rest in peace. She was an educated and humble women who loved Urdu.Nawaz Sharif should have been by her side during this painful period. Anyway, politics aside , I believe she was a cheerful lady who loved and supported her husband all the way. RIP !!! Really sad.Everyone has to go.Things to learn. Inna Lillahe wa Inna Ilaihi Rajeoon! @Munsif This is no time for such comments! It is a sad day for Pakistan. Very sad to know.My deepest condolences are with the then Pak PM Nawaz Sharif & his family members.RIP. Sad news. Our condolences to Nawaz Sharif and his family. Inna lillah-e wa inna ilayhe rajeoon. Many irresponsible ones used to claim that this was a ploy. We should watch our words. RIP. Shame on those who doubted the seriousness of her illness. RIP :-( feel sorry for her family too. @Tahsin Shah I second you for your very compassionate comments. It is very sad to visualize her last agonizing moments not to be able to find her husband and daughter near her. May her soul Rest In Peace. Rest in peace Lioness Nawaz. I hope her death is not politicised. Animosities and oppositions can rest. Its sad. Condolences to all affected. What a tragedy, Nawaz and Mariyam could not be on her bed-side. Brave and strong lady. Showed true Pakistani mettle in times of political stress. The backbone support to her family. Our prayers for her , Mr Nawaz Sharif and whole family. Heard a Khalid of PML-N make a statement, and he turned a solemn occasion into a political diatribe against PTI. They must stop. Very sad news. We were hoping for a recovery after knowing that she had gained consciousness. May her soul rest in eternal peace. Amen. Her father Dr Hafeez had treated me in childhood, as we lived in the same locality of Lahore. Very sad to hear the news. My deepest condolences to Nawaz Sharif sahib and all other family members. Polìtical differences aside.her demise was painful. Rest in peace. @Zak - Quite right. Sadly, PMLN Leader Khawaja Imran Nazeer was playing politics over this! May her soul rest in piece. Inna lillah wa Inna Ilehi Rajiun! very sad indeed. May she rest in peace. Her husband and daughter must be released from jail to attend her last rites. Condolences from India. May her soul rest in peace. Great and brave lady. My heartiest condolence to Pakistani brothers. May her soul rest in peace. Rest in peace. She and nawaz will inspire many married couple to live a happily married life in years to come. Inna Lilah Hay Wa Inna Alay Hay Rajeoon. Sorry she passed away. May she rest in peace now. Reading the messages of the general public here I feel being a part of great nation who forgive those in time of sorrow. Did not deserve to go this way without her family by her side !!! So sad to learn about her sudden demise. May the bereaved family members find solace and peace. May the family of the deaces finds peace during this tumtious times. May her family finds peace in these difficult times. May her soul rest in peace. Ex pm paid a heavy price to restore supremacy of democratically elected govt.wish he could have been with the deceased during her last days. Not many leaders other than Nawaz Sharif can claim of returning from a safe foreign country and surrendering to court of law. His reasons for frequent travels to London were reasonable. Very difficult times for the Sharif family. RIP. Sad situation for the family. Some now want to use the occasion to trap the sons. @Tahsin Shah Agreed both Nawaz and Maryam should be allowed to attend her funeral for 3 days provided both Hassan and Hussan Nawaz should also come to Pakistan to attend her funeral. Sad to have learned that she passed away, RIP. May she rest in peace. Ameen. RIP - very sorry to hear this news. Inna lilahi wa inna ilaihi So sorry to hear. May she rest in peace. A first lady in full. Pakistan’s first and best. Inna lilahe wa inna alaihe raajiaoon.